PHILADELPHIA (WPVI) -- Mother Nature is at it again and so is the Philadelphia Police Department's social media team. Whenever the weather is severe, the Philly PD makes sure to remind residents that saving parking spaces is illegal. And they always take a humorous approach with their posts. This time, with another nor'easter hitting the region, the Eagles' Super Bowl win was the police's inspiration. 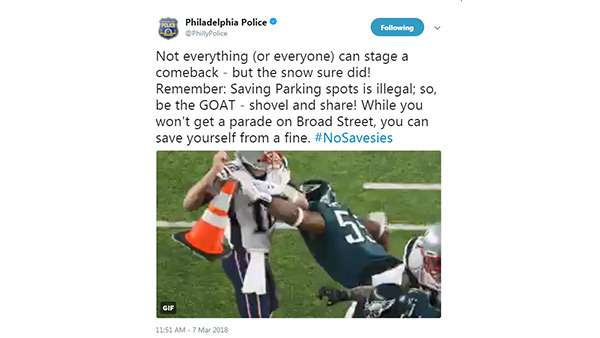 The PPD posted a GIF of New England quarterback Tom Brady's misfortunes and the Eagles' success. In a place of a football - a cone. "Not everything (or everyone) can stage a comeback - but the snow sure did! Remember: Saving Parking spots is illegal; so, be the GOAT - shovel and share!" they said. They made one last point, "While you won't get a parade on Broad Street, you can save yourself from a fine. #NoSavesies." Police channel 'Stranger Things' for no savies video. Tamala Edwards reports during Action News at 6 a.m. on December 7, 2017.